Reliable and versatile, Cometa allows you to obtain professional results in programmed irrigation with the utmost simplicity and versatility. Just 3 keys to manage programming over 4 different areas. Equipped with Water Budget function to save precious water, Rain Stop to manually interrupt the program in the event of rain, buffer battery that guarantees operation in the event of a power outage, transparent protective cover. Large liquid crystal display to facilitate reading of set data 3-button programming system. Duration of rrigation from 1 minute to 4 hours on each line. Start-time push-button for irrigation start-up. Two daily rograms with 4 start-ups per day (distribution of 2 start-ups on two programs). Weekly programming facility (from 1 to 15 days). Water budget facility to adjust set time by 25-200%. 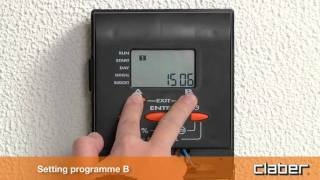 Manual start-time with irrigation time programmable as required. Test program to check correct operation of each line. Semi-automatic rogramming to activate pre-set programs. Rain-stop push-button to interrupt programs in the event of rain standby can be set as required). Calendar setting facility for odd/even days/leap years. General water budget unction to adjust pre-set water percentages. Valve opening safety device with 5 second delay. Pump control. V uffer battery. External transformer included. Full conformity with CE standards.